Second Edition AD&D / 2e Bard: What is your experience with this class? I decided to purchase a copy of the 2e book, Players Options: Combat & Tactics, because of how it beefs up the X-bow (another story altogether). I was all set to purchase the PDF copy for $9.99, off of dmsguild.com, which is an incredible resource! But, I paused, and I went to Amazon.com, to see what a decent condition, used, hard copy was available for: "very good condition", $8.51, delivered! I decided I can wait a week, or two, for a hard copy, which is less money than the PDF copy. I've learned to do this, more and more. Especially with e-Bay. I love e-Bay, but they do not always have the best prices on the market, nor do they have the best selection of available books, modules, etc. I'm sure most of you are smarter than me, and you likely have figured this out on your own, long ago... Just wanted to share that I finally woke up, and I smelled the coffee brewing. Cheers! Second Edition AD&D / PurpleWorm forum: dead, or alive? General Discussion / Anyone ever play G1 in miniature, with terrain? This shows the 2.5D approach to the walls of the Steading, using some WorldWorks Games wooden palisade wall sections, and a gatehouse. The figures are an Ettin (MK), and some Ogres (MK Kruug), with some adventurers calling to sell them Avon products. Here is a shot demonstrating the wall sections inserted into rubber mats, painted to resemble the rock surface the Steading is built on top of (as per the module, it was built on top of rock, not soil, which makes an Earthquake spell far less effective at toppling it). 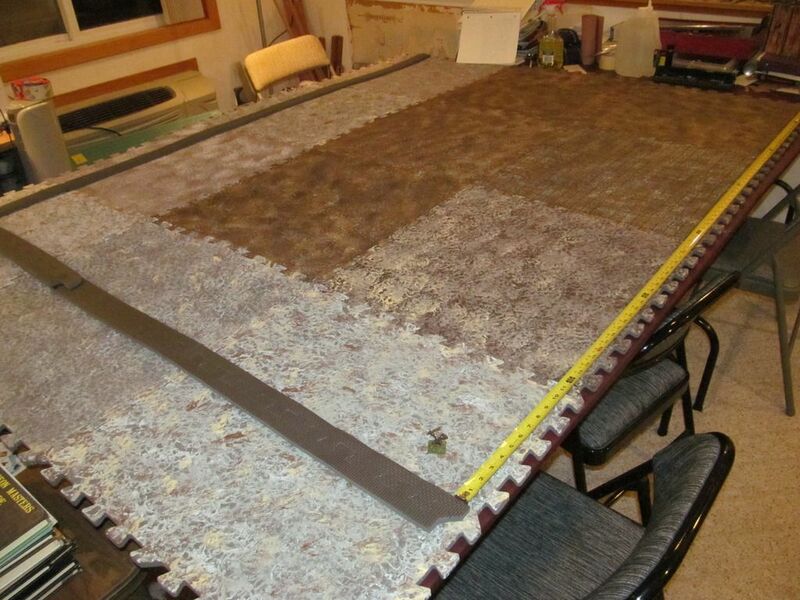 This is a photo showing a hodge-podge of painted terrain mats, with a tape measure, and gray mat border sections, used to mark the limits, in scale, of the Steading. It is quite large, in a scale of 1"=5 Feet! It is 5' 2" x 6' 8", or 300 feet x 400 feet -- larger than a football field! I am using the sizes of the Giants, as listed in the 1977 Monster Manual, not the later editions of the game, which made them even bigger... The Hill Giants, in proper scale to 25mm tall Humans, are 54mm tall. I use 54mm Cave Men figures for the Hill Giants. 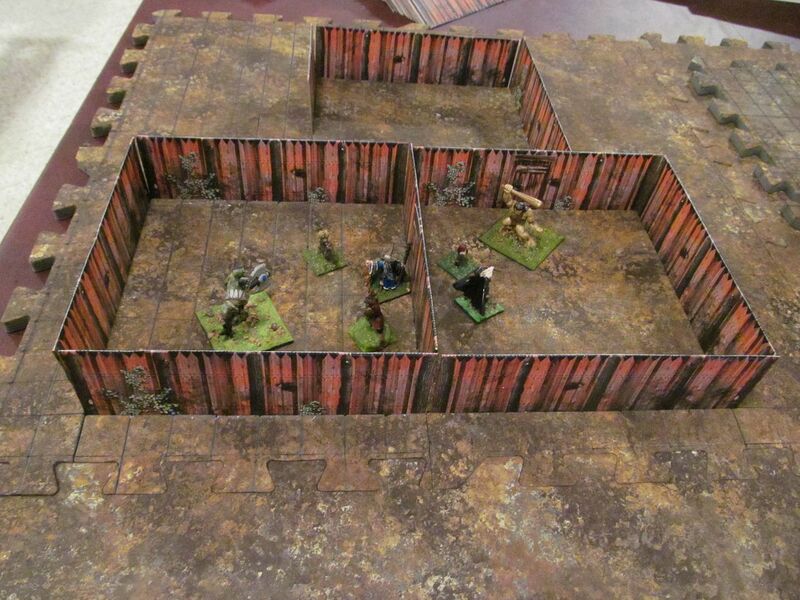 In the bottom corner, there is a 28mm Human female fighter figure, to put it into perspective, for size. I will be using the 1990(?) BattleSystem Skirmish rules to run the game. 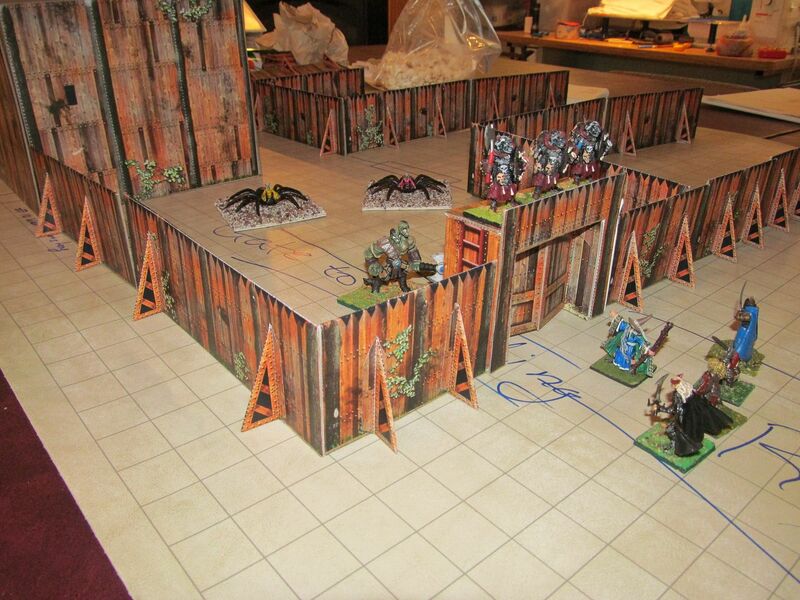 They are a miniatures rules set, with a thin veneer of role-playing on top, based upon 2nd Ed. AD&D rules. Combat is drastically simplified: Giants have around 12 Hits, while 10th level Fighters have around 10 HIts; each successful 'hit', scores one Hit of damage against the receiving figure. It uses standard THAC0 for To Hit rolls. Magic is mapped out pretty well. I hope to start playtesting the scenario the end of March, this year. Cheers!